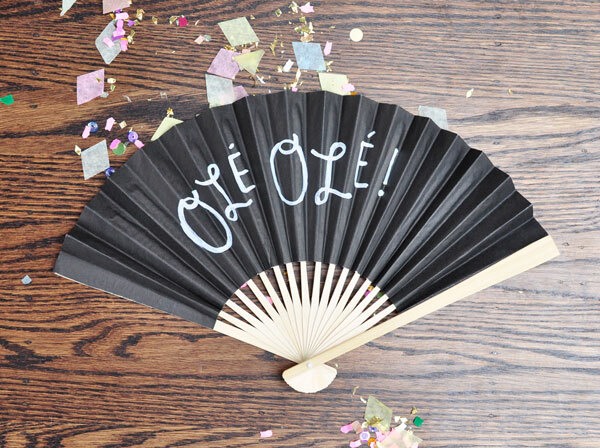 I’m in love with this Spanish Tapas party that our friends at Hello! Lucky planned using supplies from the Oh Happy Day Party Shop. They are geniuses! 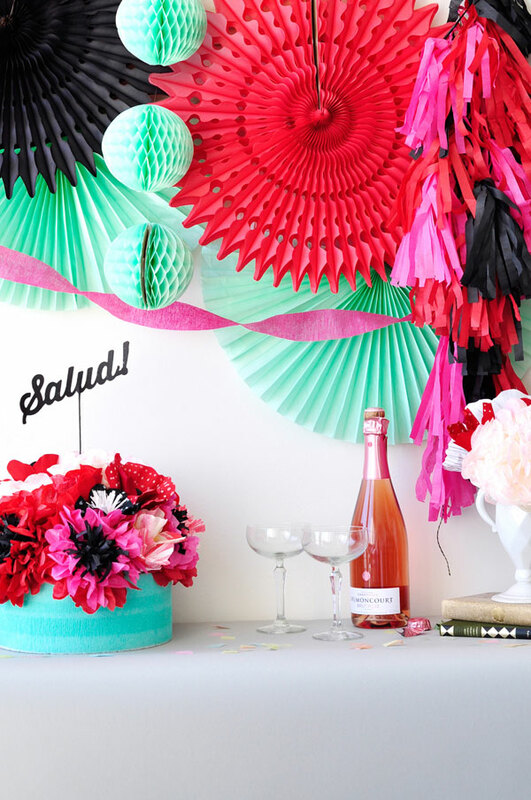 We’re so smitten with the new Oh Happy Day Shop so we couldn’t wait to plan our first party! 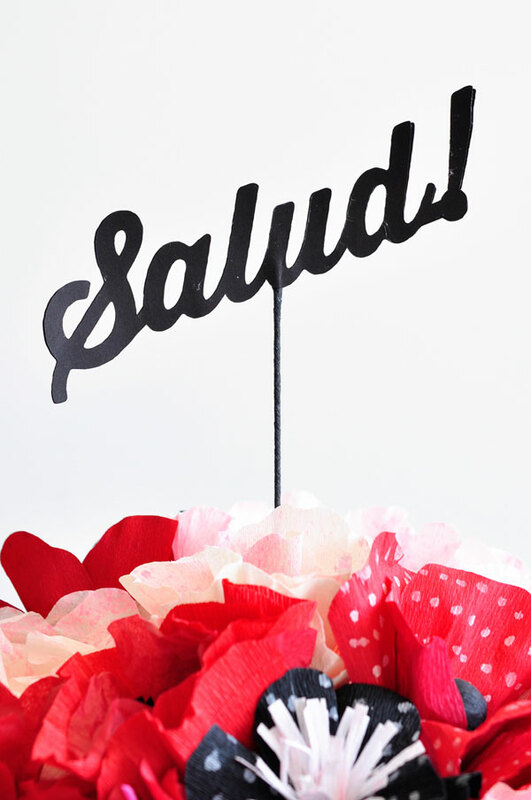 The theme was Spanish – a little tapas and a fun color scheme based on the classic black and red, plus a few modern additions to spice it up (who doesn’t love fuchsia and mint?!). 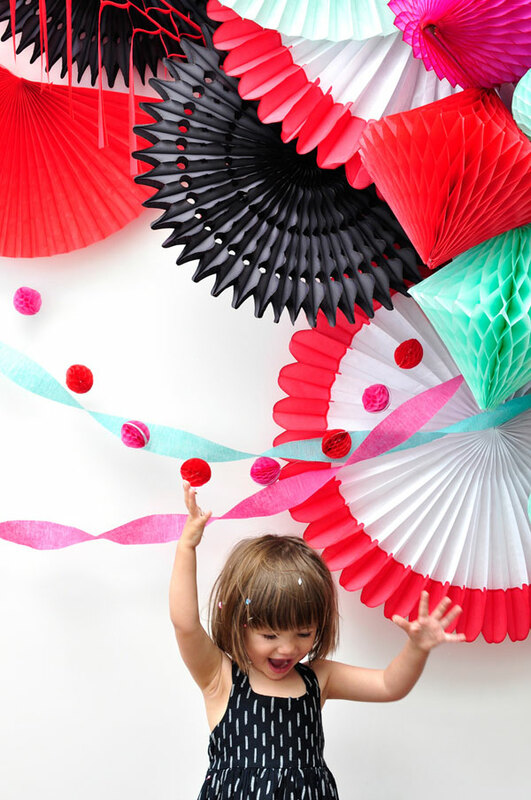 We love honeycombs, fans, and streamers (the red streamer garlands are so very reminiscent of fringed Spanish shawls). Layering them makes for a festive and impactful backdrop! We made floral centerpieces that were a combination of crepe and tissue paper flowers (check out Rebecca Thuss’ fantastic book Paper to Petal for guidance). The tissue paper flowers are a fast and easy filler to compliment the more time consuming crepe paper flowers and to jazz them up, fill a spray bottle with watered down tempera paint (we used neon red) and spray the flowers for a pretty speckle. 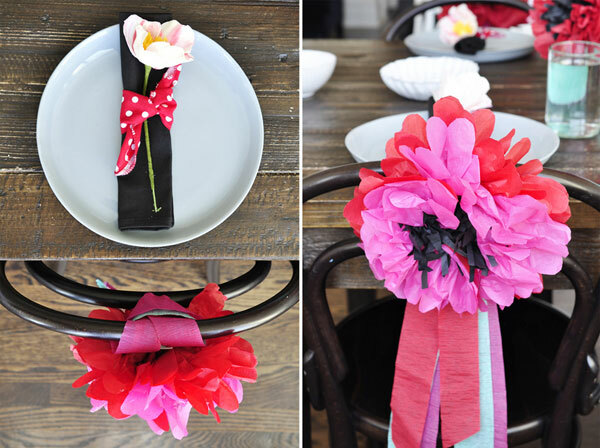 We tied our napkins with jaunty red and white polka dotted mini kerchiefs and created tissue paper and streamer chair decorations – so fast and easy! See below for the chair décor DIY. The last step was the confetti—Because it’s the ultimate party favor (the gift that keeps on giving)! Step 1: Stack 4 sheets of colored tissue paper and trim off about 1/4. Step 2: Cut the black tissue paper down about 4″ or 5″ strips. You’re only going to use one – set the others aside for other flowers. Step 3: Fringe the black strip on both sides by folding it up a few times and then cutting the fringe with a paper of scissors leaving about 2 inches uncut in the middle. 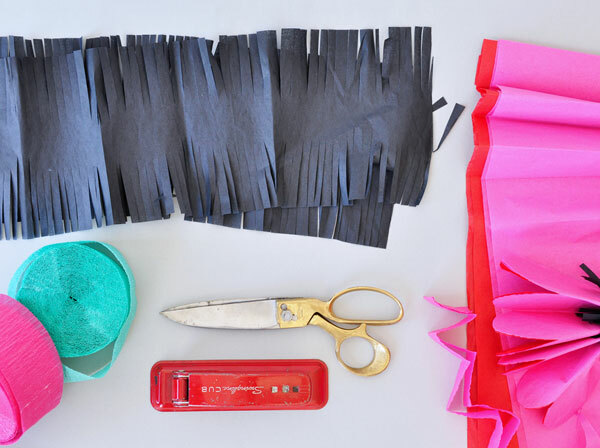 Step 4: Stack the colored tissue paper and lay the black fringe strip on top, centered. Accordion fold the stack (about 1 1/2″ folds). Step 5: Staple in the middle. Step 6: Cut each end of the folded paper into a petal shape. Rounded ends will result in more of a peony look and a pointed petal will result of something a bit like a dahlia. Step 7:Holding the paper at the staple, pull each individual layer towards you until you have fluffed up all the layers. Voilà! A fast, easy flower. Step 8: Cut three pieces of streamer, one in each color to a length that suits when folded in half (we made our pieces about 4 feet long). Fold in half to form an upside down V, stack and staple all three together at the fold. Trim bottom of each piece at a 45 degree angle. Step 9: Double stick tape the streamer to the back of the flower and double stick tape the whole thing to the back of your chair. This is adorable. Great job Hello Lucky! Yes please! Totally going to try this summer. I recognize that sweet little party goer 😉 Fabulous party, as always, Hello Lucky! Cute idea, cute little princess! Cute idea! and cute little princess! So cheery and perfect! Will we see tapas recipes in a separate post? I’m in love with this party theme! All the decor and colors are amazing together!